One with a lotus-like navel.om padmanAbhAya namahThis nAma has occurred twice earlier. In the current context where thebeauty of the celestial form of para-vAsudeva is described, the nAma meansOne with a lotus-like navel. SrI v.v.rAmAnujan gives references toprabandham to support this interpretation - "ayanaip paDaitta ezhil undiazhagu" - amalanAdippirAn; tAmarai undit tanip peru nAyagan -tiruvASiriyam.The other interpretations - One who resides in the center of the heart-lotusof every one, and One from whose navel, the Universe sprung forth in theform of an eight-petalled lotus with the meru mountain as the pericap, havebeen explained previously.SrI satyadevo vAsishTha's vyAkhyAna is again unique in not following theother interpretations. He interprets padma as "flower" or something thatdisplays colorfully, and nabh as something that does not express itself asbrilliantly. Thus, he interprets padma-nAbha as one who at the same time isthe two extremes. He is the knowledge in the learned and the lack ofknowledge in the not-learned; the one who reveals Himself to His devoteesand hides Himself from the non-devotees, like the lotus that blossoms in thepresence of the sun and the same lotus that folds its petals when the sundisappears. The Lotus-eyed.om aravindAkshAya namah.aravinda sadRSe akshiNi asya iti aravindAkshah. izahai koLSOdic-cendAmaraik kaN pirAn - tiruvAi mozhi 6-5-5; SevvariyODi nINDaapperiavAya kaNgaL - amalanAdi pirAn - 8; and rAmah kamala patrAkshah(sundara kANDa) are given as references by SrI v.v.rAmAnujan. The meaning issimilar to that of puNDarIkAkshah - nAma 40.SrI cinmayAnanda brings the similarity to the lotus in that His eyes open toHis devotees (like the sun opening up in the presence of the bright sun),and closes to the non-devotees (when it gets dark).SrI satyadevo vAsishTha derives the meaning from the word "ar" which meansgati, and vindati - prApnoti or One who has, and thus gives the meaning"candra and sUrya" to aravinda. Thus he derives the meaning "One who hascandra and sUrya as His two eyes" for the nAma aravindAksha. He who is installed in a lotus.om padma-garbhAya namah.He is meditated upon as being seated on a lotus replete with fragrance anddelicacy suited to Him. The words "sarasijAsana sannivishTah" is all toofamiliar to us. An alternate interpretation is that He is seated in theheart-lotus of those that meditate on Him - daharam vipApmam para-veSmabhUtam yat-puNDarIkam - The lotus (i.e., heart) which is subtle, flawless,and which is the seat of the Supreme Being. 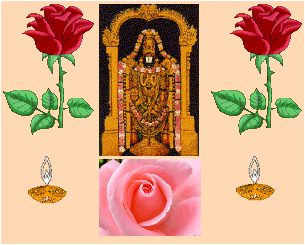 SrI rAmAnujan gives referenceto tiruvAi mozhi - taNDAmarai Sumakkum pAdap-perumAn - 4.5.8.SrI Sankara gives the interpretation that He is fit to be worshipped in themiddle of the heart-lotus, and so He is called padma-garbhah - padmasyamadhye upAsyatvAt padma-garbhah. The Protector of the bodies of everyone through foodand life-energy.om SarIra-bhRte namah.He is the Sustainer of the bodies of those who meditate on Him, since it isHis guNa-s on which they meditate that sustains them. sva-SArIra-bhUtamupAsakam pushNAti iti SarIra-bhRt - He considers their bodies as His, andprotects them (SrI BhaTTar).Or, He protects all the beings in this Universe through food and life-energy- poshayan anna rUpeNa prANa rUpeNa vA SarIriNAm SarIrANi dhArayati itiSarIra-bhRt (SrI Sankara).SrI rAdhAkRshNa SAstri gives yet another interpretation - He supports(bears) different bodies in different incarnations for the protection ofdharma and elimination of adharma.Next the magnificence of bhagavAn is described. He of immense riches.om maharddhaye namah.mahatI Rddhih vibhUtih asya iti maharddhih - One who has enormousprosperity ( SrI Sankara). SrI cinmayAnanda points out that Rddhi referstot he combination of prosperity and power. He has boundless riches whichcan bring about the well-being and protection of His devotees - tad-yogakshema nissIma vibhUtih (SrI BhaTTar). SrI v.v.rAmAnujan gives thereference to tiruvAi mozhi - vIRRirundu Ezh ulagum tanik-kOl Sella ALumammAn (4.5.1).The dharma cakram writer points out that wealth is of two kinds - thematerial wealth (poruL Selvam) and the wealth of benevolence and Mercy (aruLSelvam). Material wealth can be found both in the good and bad; but thewealth of kindness and benevolence is found only in the good. bhagavAn isfull of both kinds of wealth, and so He is maharddhih. Those who meditateon mahA vishNu's nAma of maharddhih will be blessed with these kinds ofwealth. One who keeps growing; Prosperous.om RddhAya namah. He grows when His devotees grow. He crowned vibhIshaNa and as a result Hebecame happy and void of any worry; so He grows happy when His devoteesgrow. SrI Sankara points out that He is Rddhah because He is the expansein the form of the Universe - prapa~nca rUpeNa vardhamAnatvAt Rddhah.The dharma cakram writer points out that He grows beyond the reach of theknowledge of beings. It is only by meditating on His guNa-s that one canreach Him. Thus He is Rddhah. One who is full-grown.om vRddhAtmane namah.vRddha means old. Since He is the oldest or the most ancient Self or AtmA,He is called vRddhAtmA. A natural growth cycle for human beings isdescribed by the dharma cakram writer. A cycle of this in samsAra startsfrom the womb, being born, growing up to be a child, a boy/girl, an olderperson, and IF the person meditates on bhagavAn and leads the life thatleads to moksha, and reaching SrI vaikunTham at the time of the death of thebody. This last stage is the cultimnation of the full growth in this cycle.bhagavAn was in the full-grown state before anything existed, without goingthrough this cycle, and so He is vRddhAtmA. He was the Self before allcreation. a) He with a (vehicle of) powerful axle.b) One with Great Eyes.om mahAkshAya namah.aksha means axle. SrI BhaTTar points out that in this case this refers to achariot, by means of a figure of speech where a part is used to refer to thewhole. So mahAkshah means One who has a vehicle worthy of reverence. Thisvehicle is garuDa, the embodiment of veda-s.aksha also means eyes. SrI Sankara uses this meaning in his interpretation- mahatI akshiNI asya iti mahAkshah - One who has great eyes. They aregreat in the sense that they can see not only the external object, but cansee through everything everywhere inside and outside without exception, andnothing is hidden from them. These eyes see through all that is happeningdeep within the bosom of all creatures (SrI cinmayAnanda). SrI Sankaraalso gives an alternate interpretation - mahAntyakshAni asya iti mahAkshah -The possessor of divine senses unattached to objects (SrI anantakRshNaSAstri's translation), or One who has many glorious eyes (SrI T. S.kRshNamUrti's translation).The dharma cakram writer points out that the Greatness of His Eyes refers totheir power to remove the darkness of aj~nAna when they fall on His devotee.Meditating on this nAma of mahA vishNu will give the ability to see thingswith the eye of detachment and affection rather than with the eye of desireand greed, and in opening the eye of j~nAna in the devotee.SrI satyadevo vAsishTha uses the meaning "one who leads" to the word aksha(this is also related to the meaning axle or vehicle), or one that helps inmoving. So mahAkshah is one who shows the path to everyone. One who has garuDa in His banner.om garuDa-dvajAya namah.bhagavAn has the unique symbol of garuDa as His banner, just as He has theunique association with tulasi, with Goddess Lakshmi, etc. In addition tobeing His vAhanam, garuDa is His banner as well. SrI cinmayAnanda pointsout that the eagle soars high in the sky and can see even the minutestobject on the ground and purifies the land by removing the impurities suchas the carrion etc. Similarly, the Lord never allows any negative thoughtsin the heart of His devotees, and hence the eagle is considered as Hissymbol. SrI rAdhAkRshNa SAstri refers to mahA bhAratam where garuDarequested SrIman nArAyaNa for permission to stand on top of Him when garuDahad to fetch amRta for securing the release of his mother. bhagavAn madehim His banner to grant this request, and He also asked garuDa to be Hisvehicle. This is how garuDa is both the flag and the vehicle. I do nothave a copy of mahA bhAratam with me to further elaborate on this reference.The dharma cakram writer points out that garuDa being the vAhana forbhagavAn symbolizes that the jivAtmA exists for the service of theparamAtmA, and the case of jaTAyu illustrates that when the jIvAtmA devotesits life in the service of the paramAtmA, moksham is the naturalculmination. SrI satyadevo vAsishTha points to the powerful eagle movingfast while removing the poisonous serpents at sight, similar to bhagaVanremoving the sins of His devotees.